Here are a few make up tips and tricks secrets for this cold winter month to look as beautiful and attractive as ever.You have to know what make ups flatter you and how much to or how to apply it so that it looks more gorgeous,beautiful and natural. Blush adds color to your cheeks and to make your beautiful face a rosy glow. Blush can be your beauty secret weapon.So don't try to avoid applying blush on your beautiful face. 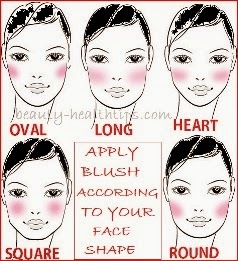 Applying blush contours and elucidate your cheek bones.The technique you apply you blush can highlights your perfect attribute.So apply blush according to your face shape.You should know your face shape first.